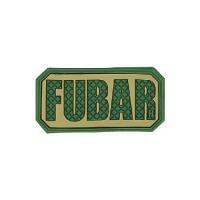 Tell the world what you really think with the Maxpedition FUBAR Morale Patch. When things are "F***ed Up Beyond All Recognition," this patch lets everyone know. Part of Maxpedition's new collection of morale patches, this accessory features original artwork unmatched anywhere else. The hook-backing attaches easily to the loop lining of Maxpedition bags and other compatible loop-paneled accessories. Additional loop material is provided, allowing for more permanent sewn-on attachment to the fabric surfaces of apparel and packs. The durable patch is constructed from PVC rubber, guaranteeing lasting service life and easy maintenance.